When I was in my early ’20’s, I worked for a Mom and Pop nursing home. One of my jobs was to dispense medication to the 13 residents I took care of all by myself every weekend. They were all comatose, but at the time, I thought that was just the way “old” people were. The owners had told me that I needed to double the dosage for one resident because she had a tendency to try and run away. Every Friday night, I would arrive at the home at 8 p.m. All the residents were asleep. On Saturday, Sunday, and Monday morning, I would get up at 6 a.m. and start breakfast. At seven, I would get the residents up. I would help those residents who needed help with dressing. Then I would serve them their breakfast and their meds (except for Monday, because my job ended at 8 am.) I suppose there were other interactions with the residents throughout the day, but I don’t really remember what they were. Mostly, I prepared three meals and gave meds. I do not remember visitors coming. In fact, probably quite typical of a young person in their ’20’s, I did not do much more than I had been hired to do and lacked the curiosity to find out more of either my employees or the people for whom I was responsible. I had other interests and this job provided me the money and freedom to pursue my other interests. Looking back on this time, I realize now that these individuals were comatose because of the “meds” I fed them throughout the day. The fact that I had no nursing experience, no CNA training, no gerontological training was not even a consideration when the owners of this home hired me. I was clearly a responsible person that they could entrust with what they asked me to do. Of course, all of this occurred pre-Nursing Home Reform Act of 1987. Once the Reform Act was made law, everything changed in nursing homes, right? Not! This past month, I was involved in a discussion on a Linkedin sugroup called Elder Care Matters. The topic of discussion was the extensive use of antipsychotic drugs with our elderly. One member attended a lecture in which she learned that 80 million seniors are on antipsychotic drugs. This number is staggering. According to an article in the American Psychological Association, there is wide abuse of antipsychotic drugs in nursing homes. Plus ca change, plus c’est la meme chose! 22 percent of the claims for antipsychotics do not comply with the Centers for Medicare and Medicaid Services’ guidelines outlining how drugs should be administered, including those guidelines stating that nursing home residents should not receive excessive doses and doses over excessive periods of time. The professionals in the field who are participating in these discussions all seem to agree that antipsychotic drugs have more detrimental side effects than benefits and that there are many alternative steps available that can and should be used before prescribing antipsychotic drugs. I agree that engaging folks in activities they find rewarding and keeping them active during the day is ALWAYS the first step. In particular, allowing patients to do those things in daily life that they are used to doing and/or enjoy and find rewarding. HHS Inspector General Daniel Levinson argued in the report that pharmaceutical companies’ marketing tactics are often to blame for antipsychotics’ overprescribing. Also, pharmaceuticals and research are big business. 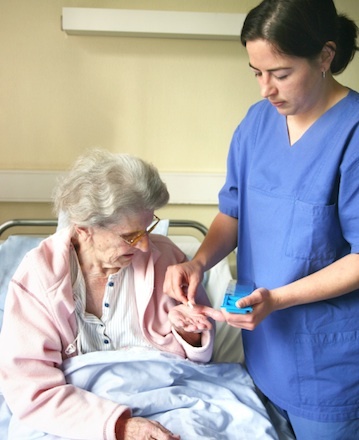 CNAs or Occupational Therapists working one-on-one with residents is not. Further, popping pills as a means of therapy reflects the nation we have become of the fast foods, the fast pace of life, and the quick fix. It is much easier to pop a pill in somebody’s mouth than to spend an hour stimulating them with social activities. This is particularly true because there are not enough professionals in the field to provide alternative stimulation. Victor Molinari, PhD, a geropsychologist at the University of South Florida in Tampa, says that another important issue is the dearth of psychologists trained to provide behavioral interventions to people in nursing homes. While he agrees that people in nursing homes are taking too much antipsychotic medication, he believes nursing home physicians are often responding to a lack of options. With boomers just entering the 65+ age group, we need to seriously re-evaluate the effectiveness of pharmaceutical drug use. Unfortunately, the alternative, having enough practitioners trained to interact with seniors, does not seem to be an available option. Med students tend not to go into the geriatric field (the return on investment is much less than work in specialty fields such as dermatology, plastic surgery, otolaryngology, radiation oncology, to name a few). A career focused on caring for older adults can be particularly financially unattractive for physicians with increasingly large medical school loan debts. Physicians graduating from U.S. medical schools in 2010 owed an average of $158,996 for their education. Thirty-nine percent of these graduates said that salary expectations were a moderate or strong influence in determining their specialty. Medicare payment rates for physicians are lower than commercial insurance rates. Medicare reimbursement rates for mental health services are discounted even further than rates for geriatric medical services. Medicare reimbursement is the major source of income for most geriatricians and, as a result, community-based geriatricians have lower incomes than most other physician specialists. Only a small proportion of practicing healthcare providers have formal training in geriatrics, with less than 1% of doctors, dentists, pharmacists, and nurses, and only 5% of social workers having certification or advanced training in geriatrics or gerontology. We need to push our representatives to allow the geriatric field to become more accessible and attractive to students entering the medical field. Subsidies for education in the field may be one way to do this. More reward out in the field after graduation through larger payouts from Medicare and secondary insurances may also help. Although dementia does strike older individuals as a “side effect” of aging, there is more and more acknowledgement that a lot of dementia like symptoms are caused by the interactions of drugs. With our father being a diplomat, our family missed most of the pharmaceutical revolution that occurred in the U.S. during the ‘50’s and ‘60’s. We did not get caught up in the cycle that so many have ended up in the U.S., the cycle of believing that every time a doctor writes a script, we need to get the script filled and we need to take the pill being prescribed. Actually, I probably should write that in spite of not being in the U.S. during the pharmaceutical revolution that occurred in the US. during the ’50’s and ’60’s, even our family got caught in its web. When we returned to the U.S. from what was then the Belgian Congo, my mother started to fall asleep at around 10:30 at night. For a diplomat’s wife, the role of which often required “on” hours from 6 p.m. forward, this situation was worrisome. She went to her doctor. He concluded that she must have gotten some exotic “bug” from the Heart of Darkness and, although there was nothing in his repertoire that might directly address the “bug,” he did have something she could take that might help her stay awake. As it turned out, he prescribed amphetamines. A couple of months later, my mother returned to the doctor and explained that the pills had worked wonderfully to keep her awake, but now she was having trouble going to sleep. “No problem,” the doctor apparently replied. He had just the thing for that. He prescribed a barbiturate. Because we spent most of our time overseas, my mother could order hundreds of these pills at a time. Although she was never quite the same, she was happy with the results. My teen-age brother was even happier, having become quite popular with his classmates as a source for uppers and downers. O those turbulent ‘60’s! When I reached my ‘40’s (the age my mother was when this “sleeping disease” hit her), lo and behold, I would find myself dozing off at 10:30 p.m. Although it is possible that I might have gotten the same “bug” having lived in the Congo as well, and it is possible that the characteristics of this “bug” only manifests in a 40 year old system, I will venture to guess that most likely, the “sleeping-disease” was merely a biological change reflecting the age. I should acknowledge, though, that even if the doctor had come to this conclusion in my mother’s case, outcomes might not have been different. In a National Center for Health Sciences article dated September 2010, prescription drug use continues to increase in the United States. In the United States, spending for prescription drugs was $234.1 billion in 2008, which was more than double what was spent in 1999. These findings are really quite terrifying and yet we continue to ingest these little blue, red, green, yellow pills with apparently no thought as to the consequences.